R30 The "R" stands for reflector and indicates there is a mirrored coating on the back of the light bulb to improve light output. The number following the letter in a recessed light bulb indicates size: it's the diameter of the light bulb in eighths of an inch. So, an R30 is 30/8 inches, or three and 3/4 inches in diameter. compact fluorescent light (CFL) bulb is suitable for recessed lights, aka canister lights, cans, pot lights, and for track lighting, or outdoor lighting. 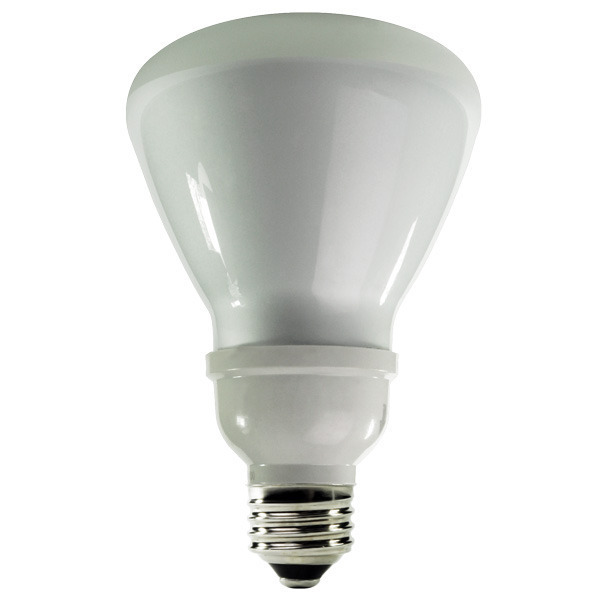 The TCP CFL is a one-piece reflector and it is UL approved for wet locations. You can replace an ordinary 65-watt incandescent light bulb with this R30 CFL bulb to lower maintenance costs and energy consumption. The bulb lasts 8,000 hours and provides warm white illumination. Note: flourescent lamps contain mercury and should be properly disposed of rather than being placed with regular household trash when they burn out; Home Depot has a recycling program for flourescent bulbs. Manufacturer: TCP International Holdings Ltd.